A wonderful addition to your everyday look or as a special gift, these earrings are timeless. Invest in diamond studs to highlight your face and brighten up your entire demeanor. Diamond studs will forever be timeless in their radiance, obtained to withstand the test of time. Elegance and regality radiate from these hand-crafted diamond studs meant to be worn in a fanciful setting or shown off daily. Assorted on untarnished, unblemished glimmering precious metals on top of ornate baskets whose ribbons are woven ever so delicately. Searching for essential everyday studs at the Los Angeles Jewelry district, certain guidelines and standards should be kept in mind. Size matters when it comes to diamond stud earrings for women - the bigger the better! Diamond studs can be retailed at an expensive cost so while seeking to purchase these dazzling diamonds, settling for a less complex setting can be to your benefit. The emphasis of this classic jewelry should be the diamonds, although they are less scrutinized than diamond engagement rings, an intricate setting can provide to be very costly. While shopping, keep in mind diamond studs are graded in four distinct categories: color, carat, clarity, and cut. Moissanite earrings are an ethical substitute and more affordable alternative in the stead of diamonds. At Icing On The Ring, we encourage seeking a jeweler at our showroom to guide you in the dominion of diamond jewelry. A classic pair of stud earrings is an essential, must-have piece of jewelry hand-assorted to last a lifetime. 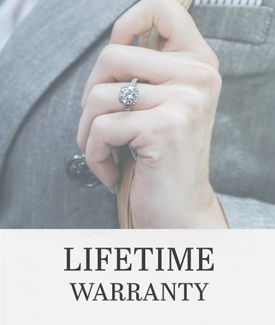 At Icing On The Ring, we ensure jewelry curated by our hands to workmanship defects with a lifetime warranty. Pairing you along with lifetime jewelry as well as providing services as your very own jeweler for life. From resizing to refurbishing, our services are forever in your good graces.